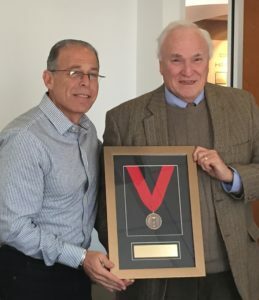 New AIA Pennsylvania Board President, Michael Skolnick, AIA presents Immediate Past President, Howard Quaintance, AIA with 2014 Outgoing President’s Medal. 2014 was an excellent year for AIA Pennsylvania. It marked the first full year for new Executive Director Steve Swarney, who rounded out his team with the hiring of Holly Lubart as Director of Public Affairs and Amal Mahrouki as Manager of Membership Relations. They’ve brought tremendous energy, enthusiasm and a fresh perspective to all aspects of AIA Pennsylvania. Working with a dedicated Board of Directors led by President Howard Quaintance, they had a long list of achievements in 2014. The Board and I look forward to working with Steve and his team to build upon this momentum, making 2015 another very successful year. This year we will continue to review the programs and services that are provided by AIA PA, with the goal of maximizing value and quality for all of our members. We believe young architects and emerging professionals are shaping the future of the architectural profession, and we will seek their involvement in all aspects of the organization, including outreach to the universities and in our advocacy initiatives with state legislators. The strength of our organization lies with the talents and commitment of our members. Feedback from our members via the Legislative Survey, initiated last December, will be used to shape our legislative agenda, and we will rely on our members to strengthen our committees and to contribute to the PA Architects PAC. Representing the interests of architects in governmental affairs and advocating for public policies that emphasize good design and responsible stewardship of the built and natural environments are at the heart of our mission. Our legislative agenda includes ongoing initiatives for P3s, continued support for PlanCon, opposition to Interior Design licensure, tax credits for historic preservation and green initiatives, and pursuing a continuing education bill for architects. In addition, we are forming a DGS task force to explore opportunities to streamline the process and strengthen our relationship with the Department of General Services. We will work with the State Licensure Board on gaining reciprocity for licensure in Canada, and for use of electronic seals on Construction Documents. AIA PA will continue to foster relationships with allied groups to pursue common interests and to seek opportunities for our members to pursue philanthropic work as “Citizen Architects.” Our communications initiatives include the recent launch of AIA PA’s new website, continued development of our social media presence, and the development of a program to communicate the value of architects and architecture to legislators and the general public. We will also be exploring the use of technology in order to overcome geographical separation to share resources and to provide content and programming to all of our chapters throughout the state. We have a great deal to accomplish this year, and with your participation we can make 2015 a success.